A draft Constitution for the Bar of List Counsel: Let the discussions begin! Author Michael G. KarnavasPosted on 2013-11-18 2018-10-18 Categories ICC, International Criminal Law, UncategorizedTags ICC, International Criminal Law, KarnavasLeave a comment on A draft Constitution for the Bar of List Counsel: Let the discussions begin! After a year of mulling the various options available for List Counsel in organizing themselves to collectively meet the challenges they face at the ICC, the best option that emerged was the formation of a truly professional Bar. While an association – as in a trade union – would be simpler and quicker to form, when considering the permanence and intended undertaking of the ICC, only a genuine professional Bar would be capable of having the desired enduring influence. Such a Bar will require ICC recognition: a tall and time-consuming order. List Counsel must nonetheless soldier on in constituting a Bar. The starting point is the drafting of a constitution, a collaborative process that is well under way, overseen by the coordinators of the Executive Committee formed last year by the List Counsel interested in establishing an ICC Bar for List Counsel. Once the Constitution is adopted, the Bar can be registered and commence functioning. So, what of this Bar and how should it be constituted? Why Establish a Bar of List Counsel of the International Criminal Court? Can justice be achieved at the ICC without due process of law? Can due process of law be achieved at the ICC without List Counsel? Can List Counsel meaningfully fulfil their duties and obligations to their clients if there is inequality of arms or asymmetry between them and the Prosecution? Can the internationally recognized standards and human rights principles be seriously advocated by List Counsel if they are without a collective voice that champions their needs so they can, in turn, champion the needs of their clients? Author Michael G. KarnavasPosted on 2013-11-11 2013-11-17 Categories ICC, International Criminal LawTags ICC, International Criminal Law, KarnavasLeave a comment on Why Establish a Bar of List Counsel of the International Criminal Court? A Bar for List Counsel is within reach – finally! Last year during the Tenth Seminar of Counsel of the ICC & Training Program held in The Hague on 17, 18 and 19 October 2012, the List Counsel who attended overwhelmingly voted to establish an association or Bar exclusively for List Counsel. The International Bar Association (“ICB”), which has been keen over the years to be the Bar for List Counsel, made a bid and lost. 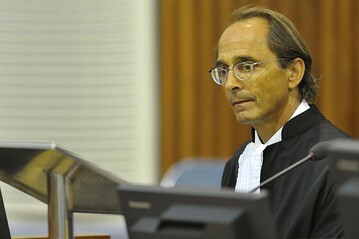 The ICC in the past had made it clear that it would not recognize the ICB as the Bar representing List Counsel. The ICB is effectively a Bar without boarders. Its strength seems to also be its weakness – at least so it appears to the Registrar of the ICC. In any event, the ICB will continue to be a major factor in assisting List Counsel, even if operating from outside the ICC. Author Michael G. KarnavasPosted on 2013-11-01 2018-07-31 Categories ICC, International Criminal LawTags ICC, International Criminal LawLeave a comment on A Bar for List Counsel is within reach – finally! Attending the Eleventh ICC Seminar of Counsel – another letdown! The ICC held its annual seminar for List Counsel on October 21 and 22, 2013 in The Hague. Three days of training followed. This was the eleventh time the ICC hosted this event. Author Michael G. KarnavasPosted on 2013-11-01 2019-03-24 Categories ICC, Training, UncategorizedTags ICC, International Criminal Law, Karnavas, Training3 Comments on Attending the Eleventh ICC Seminar of Counsel – another letdown! 28 Oct 13 — The Wall Street Journal’s on-line edition of Southeast Asia – Real Time featured Michael Karnavas in a Q&A on the Future of the Khmer Rouge Tribunal. Michael Karnavas, an American defense lawyer, has spent more than a third of his 30-year career in international criminal justice, representing defendants in war crimes tribunals at The Hague and in Cambodia. Click here to read the rest of the article.